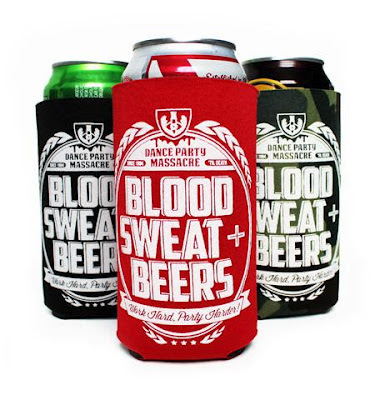 Dance Party Massacre will have you ready for all your summer get-togethers and fall tailgating with the “Blood, Sweat & Beers” koozie. This new item was added with their Summer 2012 line-up. It’s made to fit 16 oz. “tall boy” cans. You could always wrap it around a good old PBR, or maybe check out the 16 oz. craft cans from Sixpoint Brewery out of Brooklyn, NY (one of my favorite breweries). The koozies are available in a combo pack of 3 (my favorite is the camo), or you can receive one free (while supplies last) with orders over $19.95. Bottoms up!